I hold this book in high respects, it is a wonderful tale of courage, adventure, survival, and loyalty. I myself did not have high hopes for this book, being a Redwall fan, but I was pleasantly surprised on how much I liked it. It amazed me how realistic it was in the sense of what rabbits do every day and how they interact with one another. In a sense it was like the Redwall books I like so much but yet it was completely different. It did have animals that spoke but there was also humans, in which Redwall there is not. Also in Watership down they (the animals) are more well, animalistic ( and yes I know that that is not a word but it sounds nice). Even so I did really enjoy this book but I do not recommend it to people that are looking for an action packed book. This book does have action but it also has some slower parts, Which I do not mind, but others might. 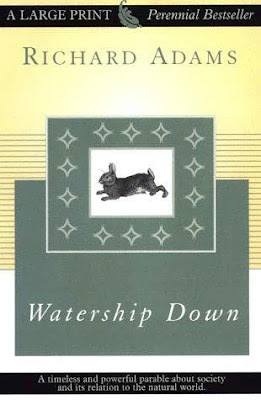 This story is mainly about a group of rabbits that have to leave there old warren in search of a new one. Through out the story they face many hardships and problems, such as a warren of highly strange rabbits that get skittish any time the word "where" is uttered, and once they find a place for a new warren they also face the problem of getting does to mate with so they don't go extinct. These and many other trials along they way create a wonderful story. I highly recommend this book to those out there that don't mind spending some time learning about nature and those who enjoy a heartwarming tale of doing what ever it takes to stay alive and protect those that are closest to them.